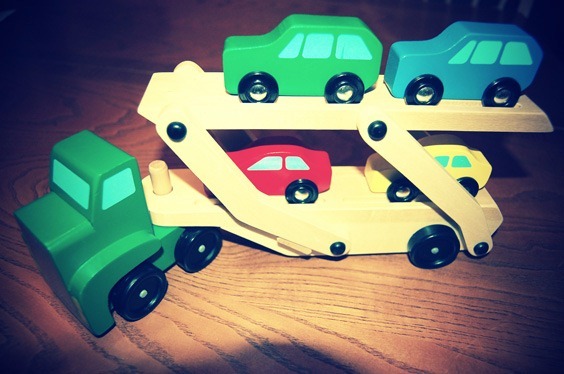 After goofing around with my kids at the Children’s Bookshop in Kent, we decided to buy this wooden car carrier for Kai’s birthday. It’s made by Melissa & Doug which makes me imagine a brother and sister team building sacksful of wooden toys from their parent’s garage. But Kim tells me they make quality toys which is another way of saying they are more expensive than they appear. So far the car carrier has been a success and we haven’t lost any of the cars down the heating vent. I may go back and purchase one for myself. I’m serious. Last year I bought a set of Monkey Benders and took them to work. Previous Post You Write A Blog? The Borders at Redmond Towne Center has the most M&D toys I’ve seen. We ordered a few from Amazon this week.